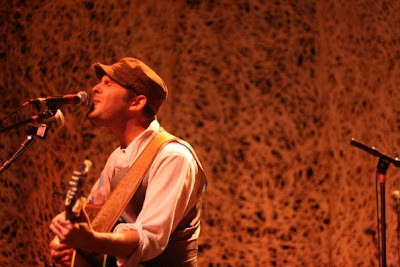 The honest, richly-spun folk of up-and-coming local musician Gregory Alan Isakov captivated a packed house in Denver last week as he opened for the Calexico show. I’ve written about the marvelous skiffle of Isakov’s “The Salt and The Sea” tune before, and have been appreciated the bright talent of this local artist in several venues across Colorado this year. I love to hear Gregory sing; his voice is really something special in the singer-songwriter pantheon, with hints of sly knowing, balanced with a warm and soaring verve. All pictures of Gregory’s set with Calexico are here. Isakov is playing again this Friday night at Boulder’s B-Side Lounge with Wisconsin folk artist Peter Mulvey. If you haven’t heard Mulvey’s songs before, you should take a listen to this collaborative set that he recorded on WPLN with two other excellent Americana songwriters in the same vein: Jeffrey Foucault and Chris Smither. I’ve listened to this set many times when I need an infusion of something weighty and authentic. Tagged with chris smither, concert recordings, gregory alan isakov, jeffrey foucault, peter mulvey. Oh, I am so glad I found your blog. This set sounds *awesome* – I can’t wait to listen to it. This is such a great set. I had seen Chris and Peter many times when I heard first heard this. It introduced me to Jeffrey and have been a huge fan since. B.o.R. is awesome! See any or all live if/when you get the chance. These three have soul. There have been a number of really good folk artists from Wisconsin lately (including Mulvey and Foucault). Another artist who fits that same mold is Hayward Williams, who has recorded with Mulvey and played with Foucault. You should check his stuff out as well. Gregory is one of my very, very favorites. Glad you like him too. His new album is coming out in late winter or early spring. Can’t wait. Can’t get the zip file to work? Is it possible to repost?